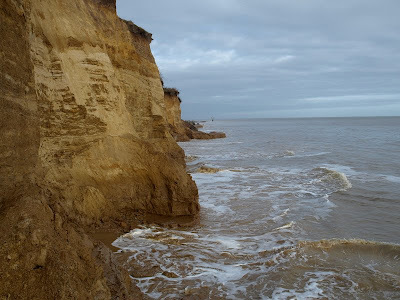 For the past thirty years or so I've been walking a circular route at Covehithe on the north Suffolk coast. Covehithe is a small place with a huge ruined church which contains a smaller church inside it. The road runs past the church, a few cottages, and a couple of farms before ending abruptly at the top of a cliff. Lumps of tarmac regularly fall onto the beach below. The walk involves covering a mile or so of beach below the cliffs and returning along the top through fields. 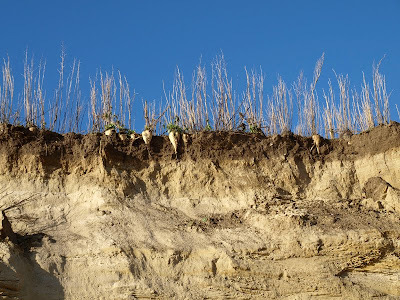 The sea has taken huge bites from the soil in places where crops were growing last year or the year before. Today was the first time I haven't been able to complete the walk. 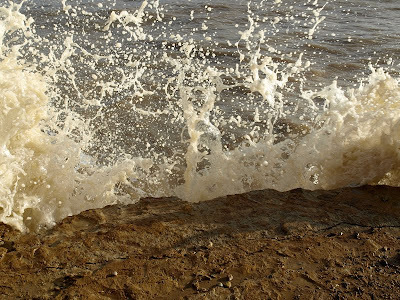 I don't know if the tide was unusually high, but it was extraordinary to watch lumps of land actually in the process of disappearing. And it was great to be outside in warm sunshine again! Great photos Paul. Particularly those dangling parsnips.